Do you remember the 3800 blocks of Troost and Harrison? 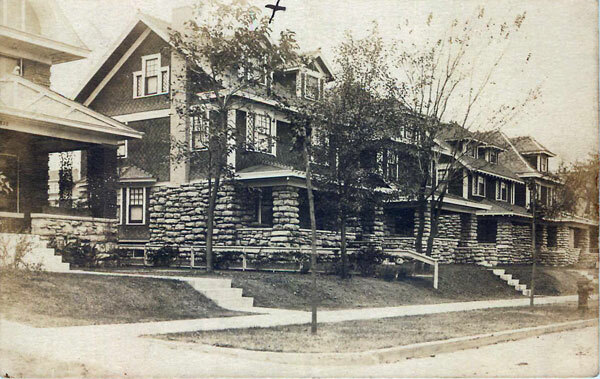 This neat row of “modern” homes sprang up on the 3800 block of Troost around 1910, when C.F. Lutes sent this postcard. Today, the homes are gone, but St. Mark’s Lutheran Church still stands on the block just north of Arrow Cleaners. Source: A complete Set of Surveys and Plats of Properties of Kansas City, MO. 1891. Like much of Midtown Kansas City, this block of Hyde Park from 38th to 39th from Troost to Harrison got filled in with residents in the first decade of the 20th century, as the growing population of Kansas City moved south. 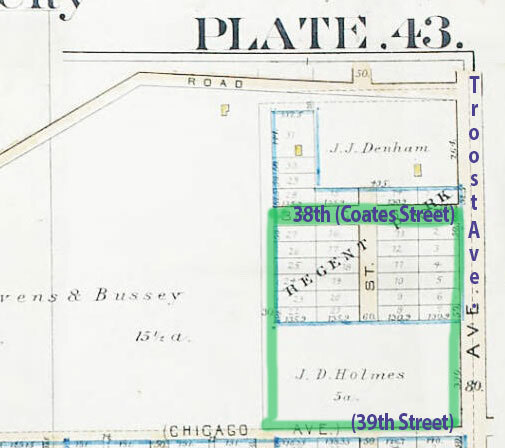 An earlier map of the block from 1891 shows lots had been divided up and laid out in the Regent Park subdivision at the north end of the block, but only a few homes had been built. A decade later, however, the area had come to life, with new residents moving in, and businesses and institutions following the movement of residents to the booming residential area. That’s around the time C.F. Lutes sent the postcard above. Lutes bought the house at 3820 Troost in 1908, according to listings in the city directories of the time. By 1910, “Ollie” or Olive Lutes was listed in census records as the head of the household and a widow, living in the home with her 11-year-old daughter Clara. By then, the area was thriving. Residents like Mr. and Mrs. Frank Kinsinger were moving in in the new homes along Troost. He was a railroad conductor. Joseph E. Harwood, a physician, also lived on the block, along with his wife, four lodgers and a housemaid. Middle-class families moved into new homes along the 3800 block of Harrison as well. The cornerstone for St. Mark’s Lutheran Church was laid in 1914 and the church expanded its parsonage and sanctuary in 1924. As was the pattern throughout Midtown, churches that had first established themselves downtown moved south as the population shifted south. 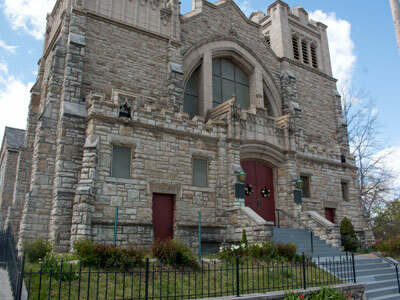 In 1914, the First English Lutheran Church bought property at the corner of 38th and Troost and laid the cornerstone for its new church. The church later changed its name to St. Mark’s Lutheran Church. Arrow Cleaners and Tailors, founded by Polish immigrant Joseph Gershon in 1914, moved to the corner of 39th and Troost that it still occupies in 1945. For a short while, the block even had its own movie theater, the Glory Theater (also sometimes called the New Glory or Anita Glory). There isn’t much record of the establishment, but it advertised movies beginning in 1918 and was a frequent site for political meetings. A fire in 1919 did a small amount of damage, but a newspaper report said it was open again the next day. There is no mention of the theater after 1921, when it was advertised for lease. 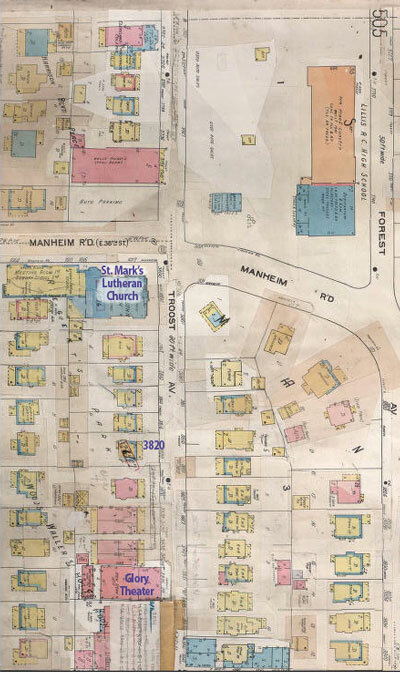 A 1907-1950 Sanborn Fire Insurance Map of the block. Courtesy Kansas City Public Library/Missouri Valley Special Collections. As part of our Uncovering History Project, the Midtown KC Post is taking a look at the 1940 tax assessment photos of each block in Midtown. Some of the photos are missing, including those for this block, but we have put together the information we could find for the area. Where is it possible to find your book Kansas City’s Historic Neighborhoods? Try Browne’s Deli at 3300 Pennsylvania or Prospero’s books at 1800 W. 39th. If they don’t have any left, contact me at mjdraper@midtownkcpost.com and I can sell you one.